I was recently asked in an interview how veganism has changed my life. Normally, questions like this bring out the best (worst?) of my indecisive nature, but this answer came to me quite easily. Veganism has changed my life in countless ways, but the one that stands out is how my love for animals has grown over the years. I’ve always been an animal lover as far back as I can remember, so looking back it’s not a big surprise that I eventually became a vegan. Geeze, I had a huge cow collection as a child for crying out loud. Seriously. A cow collection! Aside from loving animals, I have a sensitive nature and even though I’ve often viewed this trait with disdain over the years, I know for a fact that it’s shaped who I am and the choices I make. Not everyone is meant to have a thick skin. As a little girl, I used to sit on the floor for hours with animals, rubbing their head or scratching their ears as they looked at me with their big, loving eyes. As someone who has been shy my whole life, animals comfort my soul. I feel secure around them and they love me unconditionally, often washing away any negative experiences I’m going through. 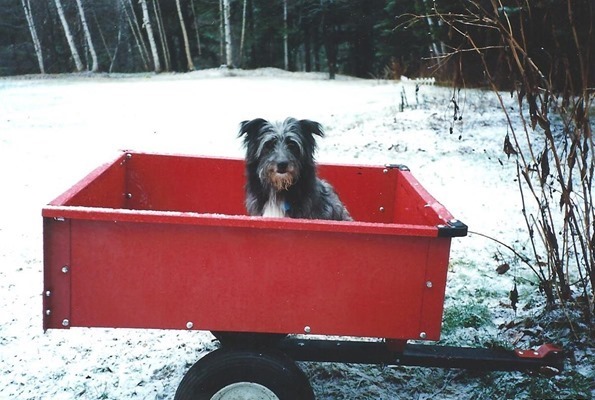 Our first family dog – a scruffy, loving little mutt named Pepper – was unexpectedly taken from us when he was hit by a car one fateful day. I’d never felt such pain ripping through my heart, as I sat on the living room floor with my mom and sister unable to stop crying for hours. He was the dog that used to snuggle me and lick away my tears when I cried. He was always there at the front door when I got home from school wagging his little tail like crazy. Of course, he slept on my bed between my legs every night. Even though it wasn’t the most comfortable way to sleep, I couldn’t bring myself to move him. My initial reasons for switching to an animal-free diet were primarily motivated by health, but as I learned more about factory farming and the way animals are so often abused, it became much more than that. My passion for animal welfare has grown in so many ways. I value all walks of life, no matter how "insignificant" some living things may seem. I’ve always feared spiders and other insects, but I’m learning to overcome these fears and no longer feel the need to kill a bug in the house simply because it makes me uncomfortable. Everything has a purpose, a value, and a reason to live. Many people will scoff at this idea, but that doesn’t change how I want to live my life. So often as humans we feel it is our right to decide what lives and what dies, but I’m tired of that way of living. Maybe I can’t change the world, but I can do my own part. A vegan diet is simply the way I aligned what’s in my heart with the food on my plate. Speaking of animal-friendly food, I have a great recipe for you today! In my mind, the only thing better than a crisp, in-season apple is having a nutty, pumpkin-y dip to go along with it. You too? What’s even better, this dip doesn’t require a food processor or 10 minutes of processing like most nut butter recipes. Simply toss all the ingredients into a blender and blend away like you would a smoothie. How cool is that? 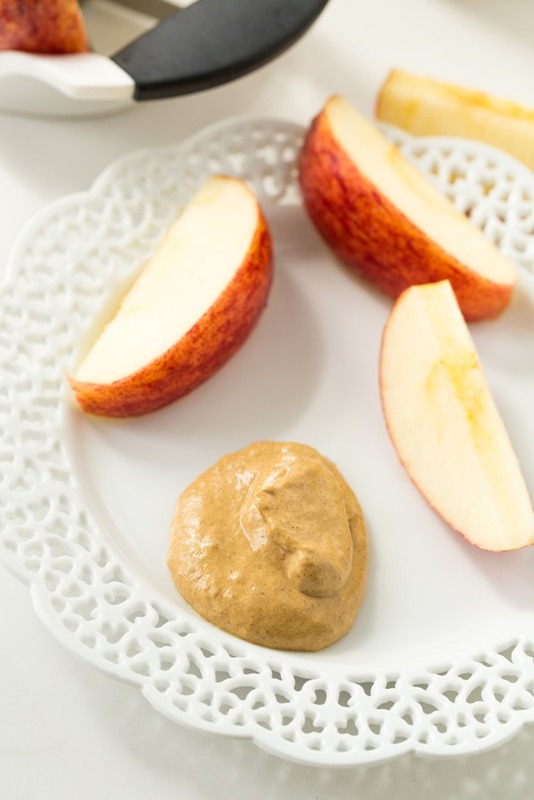 This dip is inspired by Brittany’s Raw Cinnamon Cashew Spread on We Heart Vegan. 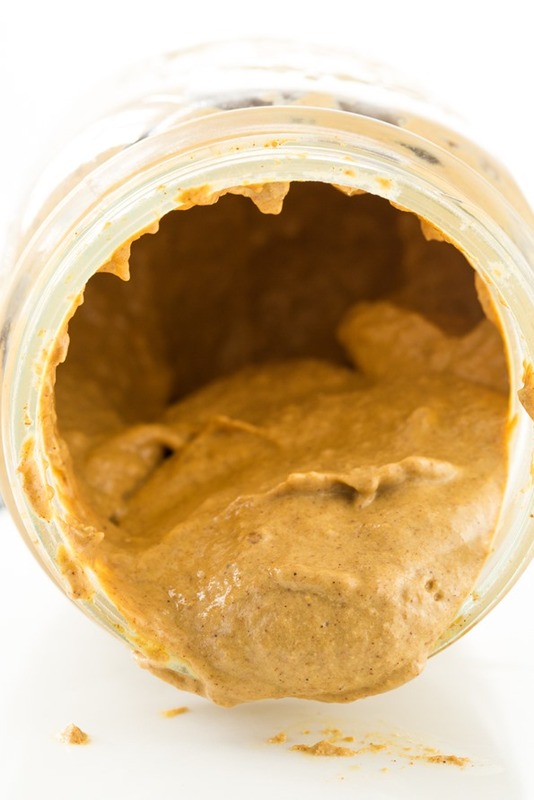 A raw nut butter made in the blender? Absolutely genius, I say. So you can credit Brittany for planting this seed in my mind. I thought a pecan + pumpkin + pumpkin spice mix would be especially appropriate this time of the year. With cooler temps over the past week, my boots and jeans finally made their first appearance. This was the perfect recipe to ring in the fall season! Well, fall is technically not for 5 days, but you know…a girl gets impatient sometimes. 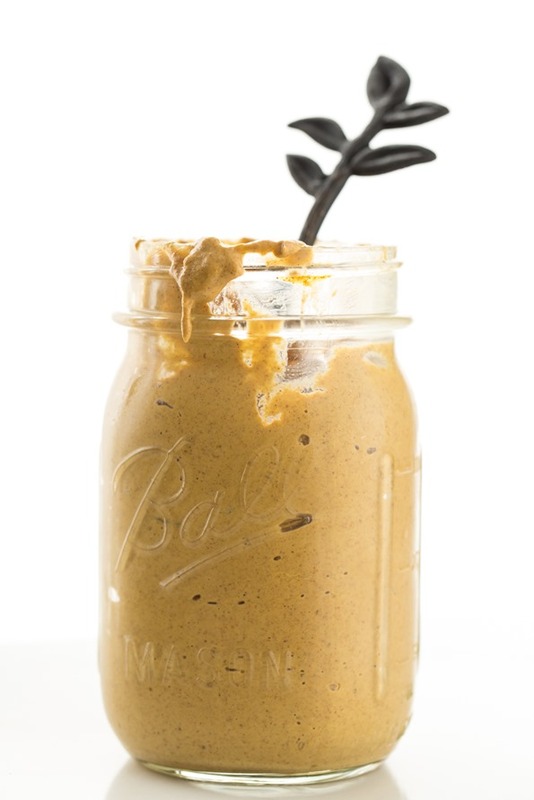 This lightened up, ultra-creamy raw nut butter is made with soaked pecans, pureed pumpkin, and a trio of pumpkin pie spices. 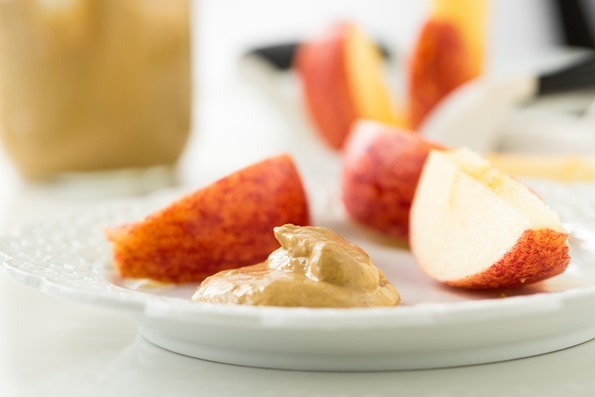 It takes just 5 minutes to whip up and it's the perfect compliment to a fresh apple. Also try it on top of hot oatmeal, in a smoothie, or layered with vegan overnight oats. Recipe is inspired by Raw Cinnamon Cashew Spread on We Heart Vegan. Thanks Brittany! Place pecans in a bowl and cover with water by a couple inches. Let pecans soak for a few hours. Drain and rinse the pecans well and then place in the blender. Add the rest of the ingredients into the blender and blend on highest speed until the dip is smooth. Add sweetener to taste. Serve with apple or pear slices. Store leftover dip in an air-tight jar or container in the fridge for 1-2 weeks. If you are looking for other jams, nut butters, and fruit butter recipes, you are in luck – I have a whole page of them! Bring on the apple and pumpkin butter. My husband and I are definitely not vegan but we are doing a modified version of the paleo diet so this butter would fit into our lives perfectly. Yum! This was such a lovely post! I feel EXACTLY like you do — its crazy really! I became vegan for health reasons and since then I have become more concerned about animal welfare. I have seen this transformation on your blog as well! Thanks for the honest, heartfelt post as well as the awesome recipe!!! Much love! “A vegan diet is simply the way I’ve aligned what’s in my heart with the food on my plate.” What a beautiful sentence. Do you happen to know the nutritional info? Looks like it wouldn’t be too crazy to eat a 1/4 cup, since its lightened up with pumpkin. Brilliant! And, pinned. Abby, I recently made this for Thanksgiving and ran the recipe through My Fitness Pal. It worked out to 25 calories and 2 grams of fat per tbsp. (based on a total finished product of about 3 cups). This looks absolutely amazing! I’m a huge animal lover too. I’m a fan of alllll things pumpkin and nut butter so I’ll be putting this on my to-make list for sure. I loved this post. I’m the same way with animals, although I am still learning to co-exist (or at least not freak out) around spiders and other bugs. Here in Florida the insects never die or go dormant so they grow to be abundant and ginormous…just sayin’ ; ) About that Pecan Pumpkin butter! I love that I can eat gobs of it because it’s got less fat…woo hoo! Oh yes, I remember when I lived in FL as a child the creepy crawlers were everywhere! We used to have Palmetto bugs in the house. Terrifying. hah. I guess it’s all relative! This looks SO wonderful. AND, as always, your photos are gorgeous. Way to go! It’s nice to hear you talk about your passion for animal welfare. I always enjoy your blog more when you add in the personal anecdotes, but I don’t believe you’ve touched on this much in the past and it was refreshing to read it. Thank you. Angela, this is beautiful and I especially love this part: “So often as humans we feel it is our right to decide what lives and what dies, but I’m tired of that way of living.” I’m tired of that way of living too. We not only decide what “non-human” creatures live or die, but humans too. A book I would recommend to you about our place in the world is called Straw Dogs by Jon Gray. I think you’d enjoy it and it will give you a whole new perspective on what being human is. This is indeed a development I have also made since becoming vegan. Oh my goodness does this look wonderful! Perfect for dippin’ those honeycrisp apples waiting for me! “So often as humans we feel it is our right to decide what lives and what dies, but I’m tired of that way of living. Maybe I can’t change the world, but I can do my own part. 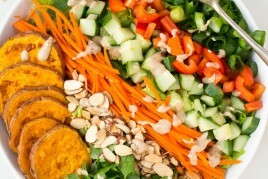 A vegan diet is simply the way I aligned what’s in my heart with the food on my plate.” This is beautiful! So much so, that I wrote it down and posted it with my other affirmations at my desk. Love this recipe and love the blog! Thanks for always coming through with wonderful fall recipes! Your pumpkin brownie pie has become a staple and a tradition at our family’s Thanksgiving dinners. Wow, this looks so creamy and delicious! That color (*heart eyes*) is incredible Angela! my husband and I are organic vegetable farmers. We don’t eat a completely vegan diet (our neighbor has goats and makes cheese!) but we try our hardest to eat locally, ethically, and sustainably. This was lovely post. Can’t wait to try this pecan butter! I’d love to know where I can buy raw, unroasted pecans. Any suggestions? bulk section of a grocery store. I buy my raw unroasted pecans at a small local health food store or a Meijer that is a chain store. what a lovely story and so inspiring. I hope to give this new a butter a try. I love the spoon! Thanks for posting this recipe :) I’m not vegan, but my boyfriend and I are switching to a healthier diet. We’re always looking for recipes that trick our taste buds into thinking they’re having dessert, and this looks like a protein-rich solution! I love the lighter-looking texture of this. Can’t wait to try! Beautifully written post. I will definitely be trying this recipe in the next couple days! Mmm this would be a delicious french toast stuffer or pumpkin pancake topper! This looks so good and how can you go wrong with pumpkin and nuts? I have tried many of your recipes and they have become family favorites, and following your website and also Vegan Outreach fb page and website have helped me align my heart with my food. I’m so happy to hear that Tonja – thanks for reading! I feel like I can really relate to what you write about how veganism has changed your lie. I have always love animals, and I miss them when I don’t have them around. But since switching my diet to vegan my love for animals has grown even more! It is no longer “just” pets I care about, but also ever other animals on the planet. Animals deserve to be treated well, and I truly do not think that they are ours to eat. And I can’t wait to make the pecan-pumpkin butter. It looks so good, and just perfect for fall. You continue to amaze me with these recipes! This butter looks incredible.. and so easy! It would be so yummy on some fresh vegan biscuits! That was a beautiful post Ange, you summed it up in such a moving way. Eating animals is definitely not for me, and there is nothing better than coming home to a waggy dog tail!! Pumpkin stuff is always a favorite! 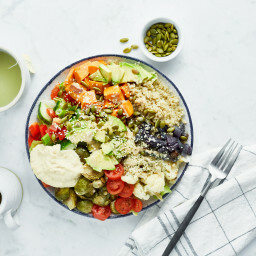 I love that this is so healthy but looks so good. Ill definitely be making this, this weekend! Oh, Angela. This is why I love you. I can completely relate to your love for animals and that is exactly why I chose to become a vegetarian. We are smarter and stronger than animals which allows us the ability to decide their fate, but we should use our power to be kind. I love that you wrote everything has a purpose. So beautiful and true. I have a hard time killing spiders now and my house is currently filled with them! Haha. This pumpkin butter sounds perfect for fall! You could have sold this in your OSG bakery. What a beautiful relationship you have with food and animals :) and good really should keep you grounded and appreciative of your health and comfort :) this is the kind of compassionate relationship I need to develop with food and life. 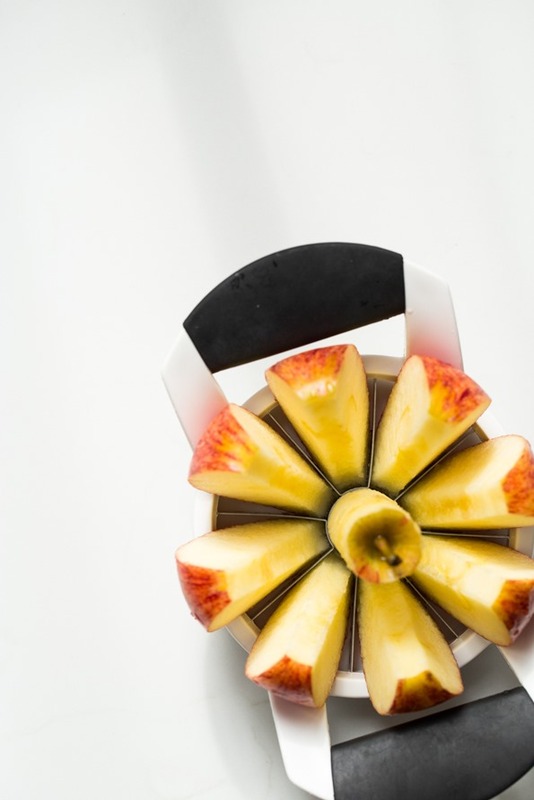 By the way, where can I get that apple slicer thingy?? Looks awesome!! oh my goodness! We had the exact same dog. Mine was Scotty. I looked at that picture of your dog and couldn’t believe it! He was a great dog. WE had him for 19 years. 19!!!!! I too was always an animal lover and scared for life when at 7 my dad took me hunting. Sigh. Oh you can bet that I most definitely will be making this! I love that you added chia seeds to the mix. I haven’t really made my own nut butter before (despite having very strong intentions to each time I see one of the recipes you’ve come up with!) but this fall it’s going to happen! Angela, is the chia whole or ground? I always love this time of year because of all these wonderful pumpkin recipes. This pumpkin butter sounds amazing! This sounds so lovely, Angela! It’s like fall blended into a bowl of creamy deliciousness! I love pecans and pumpkin together, and the more I can eat of it, the better! Your words are so so true! Sometimes I feel like animals just get me, and veganism is just another layer in caring for them. Also, the butter= falltastic! yum! this is on my list for this weekend! I hope my kids like it and it can be something fun to take in their lunches! btw – I can relate to the animal love thing – vegan/vegetarianism did not start out for that reason with me – but has become more prominent as the time has gone by. this looks so delicious and i’m loving all the pumpkin i’m seeing featured recently! I love pecan anything and this looks so yummy! Amazing photography too! The “intro” story absolutely warmed my heart – I got so lost and drawn in that I completely forgot that this post was a recipe for pumpkin nut butter! If you wrote a book, I’d surely read it! I became a vegetarian 14 years ago because I like animals and don’t want to eat them. I’m slowly but surely veering into vegan territory – I would probably be ok with milk and eggs from animals that I know (and know are loved and humanely treated), but that’s not really available to me, and supermarket organic dairy/eggs are produced in a way that makes me nervous at best. Love your blog and recipes. We had the big salad last night! Omitted garlic and water from the dressing. It was amaazingggg. Thank you so much for sharing. It was like reading my own words on the page (except my childhood furry companions were cats). :) Can’t wait to try the recipe! I love your blog so much and am constantly telling people about it. Seriously, all the time! Thanks for being you! I am allergic to chia seeds could I use flax seeds instead? Omg that looks insanely good!!! Pinned! Ohhhhh this is just what I need — I’ve pinned it, thanks for the recipe! Mmm mmmm!!! Bring on the pumpkin loving!!! This looks like a healthier version of what would happen if pecan and pumpkin pies had a baby–I like it! Mmmm I need to make this asap! I love hearing about your vegan journey! WOW. What a great combo for a dip/nut butter! All of your #veganmofo recipes this month keep getting more fabulous and drool-worthy! Such a beautiful post — beautiful words and a beautiful recipe. Thank you! This sounds simple and delicious, a perfect party dip to impress your friends as well! Angela — I am a new visitor to your site and this was the very first post I read. It is blatantly clear that the humane treatment of animals can assist in one’s quest for a healthier lifestyle. I’m so glad others can be exposed to a lifestyle that omits any animal suffering through your blog. I know I’m trying harder everyday! And your recollection of Pepper’s memory left a huge lump in my throat that I must now hug my tabby and poodle. Thank you. Thanks for your lovely comment Katie! I already made this and had it with an apple for dessert – so delicious!! And it feels great to finally eat something that tastes like fall. On another note, as a huge football fan I have a recipe request if you feel inspired by it – buffalo cauliflower “wings.” But with your typical eye toward health of course! 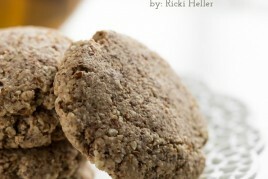 I found one recent recipe at alextcooks.com but it used white rice flour and I know you could make a healthier version!! Thanks in advance if this ends up on ohsheglows! That was a really touching story and personal take on veganism. Thanks so much for sharing with us. This looks so amazing! I bet it could easily be adapted to use steamed sweet potatoes instead of pumpkin for the pumpkin allergic among us (aka me) too. Aligning your heart with the food on your plate…I love that. So true for me as well. And this recipe looks delicious! 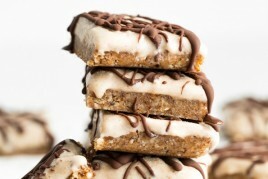 I’m in a phase right now where I have a banana with nut butter for dessert every night..this looks perfect for dessert! YUM! This may need to happen in my kitchen, like, now. I literally teared up when I read this. You took the words right out of my mouth about being vegan. I notice my compassion has increased times 1000 since being vegan- towards people, myself, nature and especially animals. The increased awareness brings out a part of you that you’ll otherwise never get to meet. Oh, and by the way this nut butter is totally awesome too<3 You're amazing as usual!!! I feel like we have the same heart. I became a vegetarian when I was 12 because I loved animals too much to eat them : ) I go out of my way to save bugs and I feel I’m more sensitive to animal “issues” than many human ones. Oh, and I also have a minor obsession with cows, haha. Thanks for this post. I’ll definitely be trying this recipe asap! THANK YOU, this is exactly how I feel, but you’ve given it the words I couldn’t find. Also, a lovely recipe, and I will make this! This buttah is absolutely perfect. I can’t wait to give it a try. Your puppy is too cute. Wow, Ange, this post is so amazing and heartfelt — you articulated exactly how I feel about animals too. So eloquently stated. I love it. I just fell in love with your blog and I’m now following along via Bloglovin. I love animals too, I’m a vegetarian, and I’m working on going 100% vegan. As soon as I read this recipe yesterday I knew I had to make it! I promptly soaked my pecans and had just finished scraping the blender when my kids got home from school. 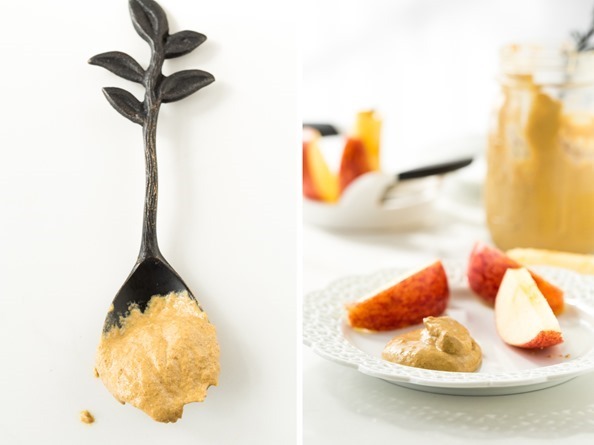 We all sat around eating apples and warm pecan pumpkin butter…so, so yummy!!! I couldn’t stop thinking about it and had two pieces of toast covered in pecan pumpkin butter last night before bed. Then, this morning, I made pumpkin pancakes and smeared on some more. Excellent recipe!!! Could I use cashews in place of the pecans? I have lots of cashews on hand. Hey Jennifer, I can’t see why not as long as you like the flavour of cashews! I made this tonight and it was delicious!!! Once again, your recipe is amazing! You are really talented and I’m glad I found your blog. Can’t wait for the cookbook! Every part of this recipe sounds amazing. I’ve been holding off on the pumpkin because i go so CRAZY in October for pumpkin, but perhaps it’s close enough to make some of this! Angela this recipe is fantastic! I just finished making it, and have already had seconds within the past 25 minutes! Thank you for your recipes, beautiful photos, and kind words that remind us to connect with the world around us through our actions. As a budding dietitian, I recently went vegan for a week so that I could gain some insight and decided to focus on vegan research and information for that week. It was eye opening. I have gone back to eating some animal products again, but not nearly as many as I was used to consuming. I feel better now than I did and I feel that the more I learn about the vegan diet, the more I lean in that direction. I am excited to learn more and see where this road leads! Beautiful post. As other readers have said, many of your recipes are my favorites. And this is a great one! Made this yesterday and enjoyed it on apple slices as suggested. Trying to think of other good uses for it! Maybe in a smoothie? Angela, my roommate and I literally just made this recipe, and are simply standing in our kitchen convinced dipping chopped apples and convinced its the best thing we have ever eaten. New autumn staple :) thanks for the recipe! This was such an inspiring post. I tell everyone, vegans and non-vegans about your recipes. Just made your guacamole tonight and it was delish! I have a question tho, in recipes like this should the coconut oil be melted and liquid or in solid form? Your recipes are always so sophisticated and creative but I still love when you write more with your sensitive nature. And I remember reading your story and a thin skin wouldn’t really fit you girl. You were brave enough to change many times, that’s hard job! Congrats on putting together such a nice blog! I guess I never saw it that way, but thank you! SO…we’ve been playing with nut butter and we made a soaked almond with coco powder. It was terrible! It tasted like soggy bread blended with chocolate. Did I do something wrong? I’m so nervous to blend my soaked nuts again! Love to snack on them…just not butter them. So the pecans are ok? Thanks, btw. I’ve LOVED all the recipes! I’ve even got my Dad (recent health nut) addicted to your site. :) Thanks for showing me that it can be done: eat healthy and deliciously! I’m a big fan of yours and keep trying my hand at your recipes..
I’m from India and many of the ingredients aren’t that widely available here..
Angela! 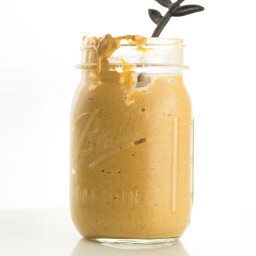 Just made the Lightened Up Raw Pecan Pumpkin Butter, and it is delicious! My first nut butter, and it looks just like the picture. I so enjoy your blog, and have enjoyed your recipes for about a year, now. I have enough printed out to put together your cookbook! Many thanks, and be well!! We made it sans chia seeds and it was fabulous! So far I’ve had it with apples and on a rice cake, I’m going to put it in my oatmeal tomorrow morning. Thank you, Angela. I am so excited for to start the fall season with this pecan pumpkin butter! It is DE-LICOUS! I can sympathize with you, I remember when our family dog (half Pomeranian half poodle) was taken from us. I was devastated, animals really do just love you unconditionally and they are always so happy to see you :). Just wanted to say that this post (including the yummilicious recipe of course) is the best and most heartfelt thing I have ever read in the past few weeks. You got yourself a new fan! Thanks for sharing about your vegan journey. I feel like mine is similar. Ooh that pumpkin pecan butter sounds awesome! Made this recipe and it is insanely delicious and easy. I went slightly lighter on the sweetener and slightly heavier on the spices and I added 1/8 teaspoon of ground cloves as well. It came out so creamy and flavorful. Try substituting sweet potato for pumpkin! Yum! Angela, your post actually brought me to tears. It is so nice (& comforting) to hear someone express EXACTLY as I feel when it comes to animals. My childhood dog was even named Pepper as well! Your words on respecting life, no matter what size or form, was so articulately put. Just made this- it’s so good, I could just eat it plain!! I loved reading the story! And the pumpkin spread looks so delicious! Perfect time for fall :) Any other recommendations you have that this spread would taste great with? have been reading your blog for a long time but just wanted to take a moment to tell you how much i enjoy it — your recipes, and your heartfelt commitment to this lifestyle and to the cause you believe in. incidentally i did make this “butter” this past weekend (the only tweak i made was to add a little almond extract to amp up the nutty flavor) and have been enjoying it in parfaits, on waffles, as a topping for latte-flavored vegan ice cream, and with raw apples for the past couple days. another great recipe — very versatile and truly encapsulates what i think of as “fall” with its rich and warm flavors. Thank you for sharing your thoughts on being vegan, I am not vegan, but I always love to hear people’s reasons for their passions :) This butter made my mouth water! Angela, thank you, a million. This is yummolo!!! I just made it and had it as a dip with farmers market apples, outstanding. I already layered it with vegan oats and sliced apples for breakfast…..alarm goes off at 5:00 am tomorrow :). Your recipes are fantastic. This was AMAZING! Unfortunately I just discovered this week that I’m allergic to pumpkin, seriously what is fall without pumpkin. So I was thinking of doing apples and walnuts instead of pumpkin. What do you think? How many apples do you think would be good and do you think I need to cook them? Angela, I must thank you for this amazing recipe! It turned out perfect and I’ve been putting it on everything lately . . . and just eating it by the spoonful. You are a genius!!! I have been a devoted follower of your blog for quite awhile now, but I felt a need today to thank you for this wonderful post. My number one reason for leading a vegan lifestyle is animal welfare. Your words mirrored my thoughts exactly. The more people know about the atrocities of factory farming the better. If we keep spreading the word and the love, we will definitely change the world! Thank you Kristi :) I’m so happy to hear you are enjoying my writing & blog. All my best! Thank you so much for this recipe! This is one of the best, I find! :) I’ve only just begun vegan recipes last year to switch up my diet sometimes and I always turn to your blog for healthier (and better) recipes! I’ve got raw walnuts and cashews to use up… Do you think I could sub one or both for the pecans? Looks mouth-watering!! Cashews would probably be really nice…I’m not sure about walnuts as they are bitter (might need more sweetener to balance) good luck! Made this yesterday,unbelievably yummy! Gave a jar to a non-vegan friend who declared it was the best thing she’d tasted in evers. Thank you! Perfectly said. Thanks for a lovely post. you have done it again! an incredibly tasty recipe. thank you thank you thank you! I love love love your recipes. I made this today and substituted cashews for the pecans and it came out so yummy. My family and I could live off of your recipes. Thank you! This is a fantastic recipe. I put some in a smoothie this morning. Thanks! I’ve been following your blog for over a year now—it was actually the original Green Monster that got me to go vegan, basically on a whim! As you reflect above, it seems like the ethics of being a vegan evolve the longer you keep animal products out of your food. Anyway, THIS recipe gave me the courage to finally post a comment. The texture is so light and creamy, almost whipped, and I like how it can be mild or dessert-y just by altering the very few ingredients in there. One of my favorites, for sure! For easier cleanup, put your ingredients right in your bell or mason jar and screw it on the blender ring. Blend it right in the storage jar! This is sooooooooooo delish! Such a yummy treat – and so healthy! Love Love Love it!!!! P.S. – I love your blog and your awesome recipes. You ROCK!!! made this last night and took some to work for lunch today..LOVE it. it’s so perfectly light, sweet but not too sweet, pumpkiny but not too heavy. i had it with some graham crackers because i didn’t have time to slice apples and dip them in lemon juice, but i’ll be taking those tomorrow. thank you so much for the great recipe! Quick questions! Can I use unsweetened vanilla almond milk or should I be sure to use original unsweetened? Also, should the coconut oil be melted or solid? I cannot WAIT to try this once I restock my maple syrup supply! Love your blog I am new to vegan cooking and have loved all of your recepies I have tried! Wondered if anyone has used homemade pumpkin puree for this recipe? I have something in the freezer I would live to use up but worry it may be too watery. A few of the things you said in this well-written post resonated with me. Beautiful. I made this butter tonight after blending roast pumpkin to make puree (I hate cleaning the blender more times than I need to!). I changed a few things ingredients due to dietary restrictions: I used almonds instead of pecans, and stevia instead of sweetener (and added a little extra mylk). I also omitted the oil since I’ve been reacting to coconut lately, but decided not to replace it. Next time I make it I think I will add some non-coconut oil, but this batch was delicious just the same. I think it ended up a little milder with almonds instead of pecans, but can’t say for sure. I can see this as a great addition to my quinoa porridge these next few months =). Thanks for the lovely recipe, and for sharing a piece of your heart’s thoughts. At first I was worried about using the entire batch, but this recipe was AMAZING! I wish I had doubled the recipe. Excellent with your Banana Oatmeal Muffin tops or hemp waffles. Thank you for all of your hard work! I saw on a post that you subbed fresh tomatoes for canned tomatoes, we just grew sugar pumpkins, can I sub those for your canned pumpkin puree? oh never mind! just saw your post on just this! sugar pumpkin roasting and fresh puree! While I could never give up meat, I am more conscious of my sources and hubs and I prefer wild game to store purchase. My reasons are, in part, the poor US regulations and the poor conditions for animals. I think my view is more quality control and natural than vegan but I can certainly appreciate your position and rationale. That said, this is a lovely recipe and I’ll be trying it soon. Do you know how well it may freeze, or not at all? I may need to halve the recipe, if not, to avoid waste. 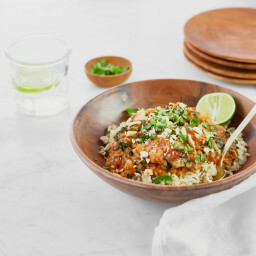 Love you, the website, your recipes, THIS recipe (so far my all time favorite recipe is the Soul-Soothing African Peanut Stew from your cookbook!) …but I have to know: where did you get the spoon with the leaves on it? I checked Etsy.com for what seems like hours and I can’t find anything like it! Thanks! I know u will never read this but…………if every life is precious why would u take birth control to potentially end a precious human life? People have way more value than animals. Like u said people think they can just choose to end a life. its really sad u could think like that. Just wondering about shelf life. I was going to make different types of nut butter instead of Christmas baking as little gifts and I love this one. Do you think this be frozen as well? 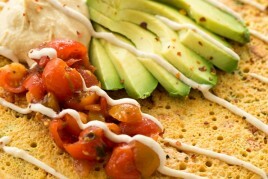 Previous post: Jumbo Chickpea Pancake – A High Protein, Filling Vegan Breakfast or Lunch!